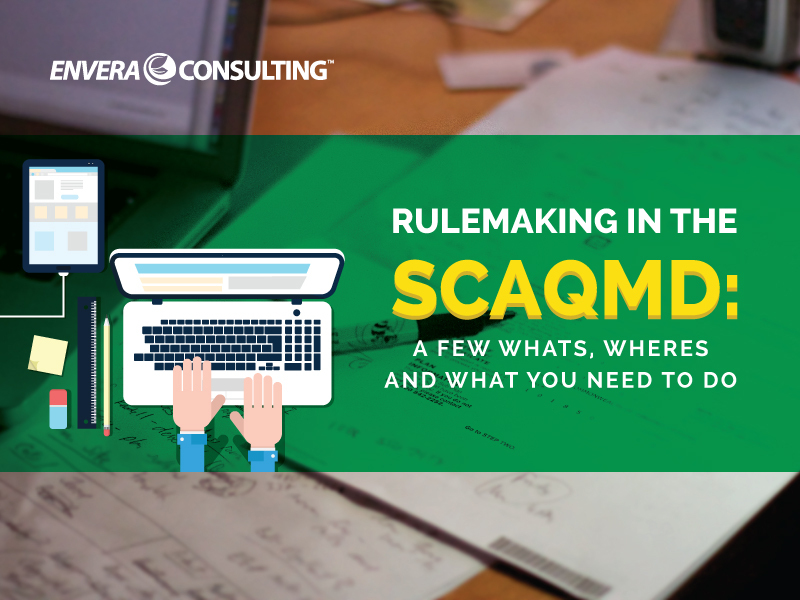 We all know by now that the SCAQMD has quite a few rules and regulations. But just how did the agency come up with them? And, more importantly, has the SCAQMD ever been wrong when it created a rule? Before I jump in, let me start by saying that the SCAQMD has a very difficult job of trying to clean up the air in Southern California. It’s not one I envy. The SCAQMD has two general types of regulatory programs that control how much pollution is emitted into the air. The first is a market-based, cap-and-trade program, called RECLAIM, which is specific to our air district. The second is a command-and-control program, which puts a cap on the levels of certain emissions and requires facilities to either purchase new equipment or change their processes in order to meet those limits. Most of the facilities that Envera works with fall under this latter category. Some of the most common command-and-control programs can be found in Rule 1147 (which pertains to miscellaneous combustion equipment), Rule 1110.2 (which covers stationary engines), and Rule 1146 (which covers boilers). One of the reasons coming up with a command-and-control regulation is so difficult is because it requires extensive research to support the determined level of emissions. That requires a thorough understanding of the current state of the art when it comes to all the available emission profiles and emission-reduction technologies for all possible sources. Just think about that for a minute. That’s mind-boggling. There are a bazillion (give or take) different sources of emissions. In order for the SCAQMD to come up with effective command-and-control strategies, it needs to understand what is not only the current landscape of emissions but what is technically possible based on the current technology and the current development of all of those pieces of equipment. Current estimates show that there are about 27,000 regulated sources in Southern California, in industries ranging from refineries to power plants to chemical plants to manufacturing facilities to dry cleaners to gas stations. Each of those industries has numerous types of equipment, and each one of those pieces of equipment can have their own innovation timeline to control emissions. That makes developing command-and-control regulations quite an exhaustive research task. Has the SCAQMD Ever Goofed Up? Raise your hand if you’ve never made a mistake in your work. Now that we’ve established we’re all fallible (or at least honest) humans, I can tell you that there have been times that the SCAQMD may have tripped up here and there. But with the massive amounts of data they’re crunching, that’s to be expected. Actually, all things considered, it’s a wonder it doesn’t happen more often. When it comes to command-and-control regulations, the SCAQMD has made a few errors in their estimations. And that’s because there’s simply too much data to collect. It’s like sending a botanist into the rainforest to identify every single type of mammal within a 10,000-square-mile area. (That’s the actual size of the air district.) When the SCAQMD has erred, it’s because it wasn’t able to fully grasp the entire landscape or the technology of a single piece of equipment well enough in order to control it to levels that it deems appropriate. One specific example is Rule 1147. When the agency came up with the proposed emission limits for Rule 1147, the baking industry responded by saying that the emissions were not possible given the current state of technology. In other words, what the SCAQMD thought was possible wasn’t. And it was the baking-industry folks who let the SCAQMD know as much. The result: Rule 1153.1 was created, which gave the bakeries a longer time to comply. The point is that when the SCAQMD develops regulations, the emission levels they propose are only as good as the research they’ve done and the data that is out there. Exhaustive searches are, well, exhausting — and, let’s be honest, not always possible. But let’s give the SCAQMD credit for both listening to the folks who came to them with the facts and for making the necessary changes to the regulations. So when the SCAQMD proposes a rule change or new rule, you really need to make an effort to be part of the process so you can gauge the level of feasibility of the emission levels they’ve proposed. Are they reasonable? Can they be achieved? Has the technology evolved to a level where that is even possible? In some cases, you’ll have the opportunity to submit public comments, such as that the proposed emission levels are unreasonable and the reasons why. And it’s critical that you do so. Because without your input, the agency simply relies on their research, which may or may not fall in your favor. So I urge you to be active in the rulemaking process — for your sake and everyone else who is beholden to the rules.